The Bay Roberts Cable Station was constructed by the Western Union Cable Company in 1913. It was built by Western Union as a relay station to house transmitting equipment for new and original cable lines running between the United Kingdom and the United States of America. Western Union Cable Building is a good example of an early 20th century commercial building with Classical Revival elements. In 1910, the Western Union Telegraph Company of New York selected Bay Roberts as the landing site for a transatlantic cable. In August of that year, the cable ship "Colinia" commenced to lay the cable from Bay Roberts en route to Sennen Cove, 10 miles from Penzance, Cornwall, England. At the same time work was started on the second line of cable to Coney Island, New York. In 1913, the Company erected the Cable Station to house the transmitting equipment. The coming of Western Union to Bay Roberts brought employment to many residents. In addition to a staff of about 45 operators, there was considerable work for carpenters and labourers. Later, local people were trained for some of the technical positions. The construction of the Cable Station was followed by construction of residences for the staff. A new street, named Cable Avenue, was laid out with sidewalks, street lights, chestnut trees and duplex houses on each site. During the Second World War, the Cable Station was guarded by the Newfoundland Constabulary, the Newfoundland Militia, and Québec soldiers from the Canadian Army. The reason for the security was that in addition to the important communication link between the UK and the US, one of the cables carried a private line between Winston Churchill and Franklin D. Roosevelt. A good example of an early 20th century commercial building with classical revival elements, the Cable Station has been restored to house a museum, art gallery, and municipal offices. 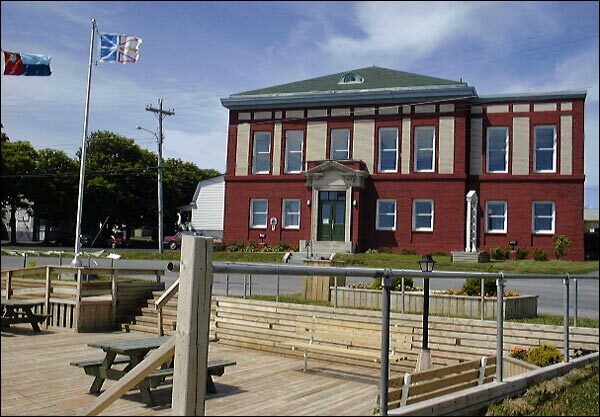 The building was designated as a Registered Heritage Structure by the Heritage Foundation of Newfoundland and Labrador in October 1998. Also view the Western Union Cable Building Registered Heritage Structure, and the Western Union Cable Building Municipal Heritage Site on the Heritage Foundation of Newfoundland and Labrador web site. The Newfoundland and Labrador Heritage Web Site has on its site only a portion of the registered heritage structures in Newfoundland and Labrador. To view a complete list or search for a particular structure visit the Heritage Foundation's Property Search page.